One morning I found Kavya, my fellow-traveller in Thimphu, and our hostess Sania, discussing the famed Paro airport and the perils that surround it. Kavya was narrating her experience as she had flown to Bhutan, while I had gone overland. If you do not already know, Paro airport is one of the toughest airports in the world, as stated by Boeing. 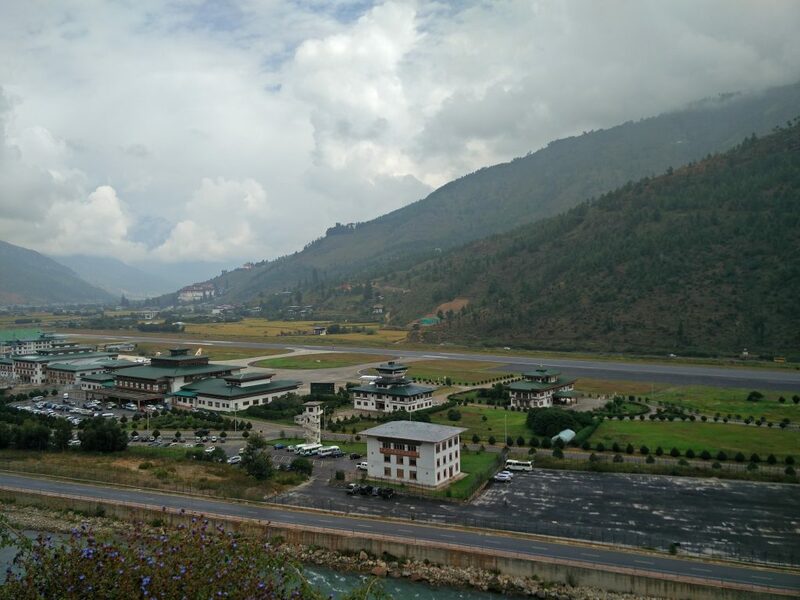 It is the only commercial airport in the Royal Kingdom of Bhutan, and has only eight pilots certified to land the aircraft. 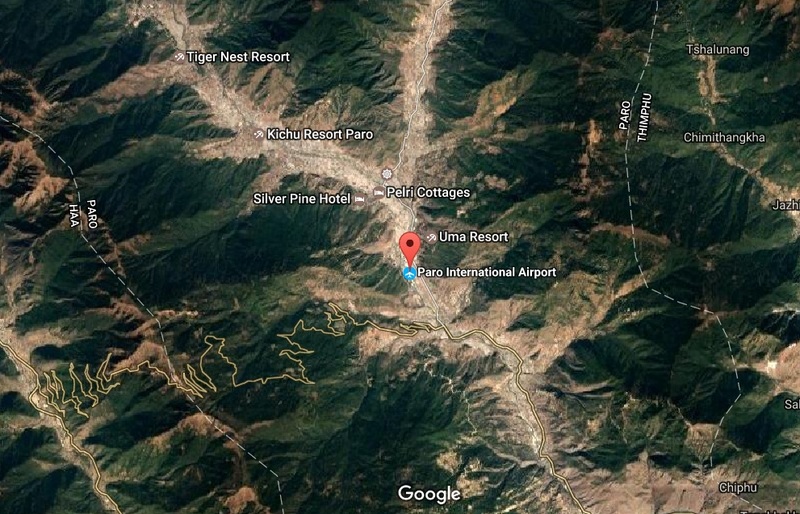 Satellite view of Paro airport; make note of the fact how it is surrounded by gigantic mountains, with a runway strip which is only 1.9 kilometers long. After Sania and Kavya’s discussion, I was intrigued and decided to dig deeper once I was back from the trip. Paro is a valley-town in the Himalayas; it is surrounded by hills all around. This also means that the airport is operational only during the day-time, with Visual Flight Rules (as opposed to Instrument Flight Rules) in place. To put things perspective, visual flight rules call for the pilots to use their own judgement to maneuver the aircraft while landing and taking off . Since the decision is taken based on their knowledge of the terrain and landmarks in the valley, coupled with quality of visibility (and NOT because a gadget conveys some information), there needs an absolute clarity in the weather for a safe flight. While landing, the pilots hand-fly the plane with their local knowledge, navigating it mindful of the electric poles, roofs of the homes, trees, hill-sides etc. It is almost like the aircraft is being flown in the alleys. Later, Sania told us that there are times when it feels that the plane might crash into one of the hills-sides, or trees. Understandably so, because it flies right next to it, aiming to touch the 1.9 kms runway with enough run-distance on the ground. Not only that, she also explained us how one doesn’t see the runway right until one final steer before the touch-down. The airport has a dedicated viewing point for people who are interested, but the flip side is that the view does not give a clear line of sight to the navigation that takes place just BEFORE the plane hits the runway. For a viewer, the aircraft just materializes on the runway, and that is when you get to see it. How to book a flight to Bhutan? If this is the question that landed you here, please refrain from scouring various flight-aggregation sites; Druk Airways is the way to go. A few days ago, a harried reader wrote to me asking if other airlines fly to Paro. Only Druk airways flies from Siliguri, Kolkata, Delhi, Gaya, Guwahati and Mumbai in India. Apart from India, the airline also services Bangkok (Thailand), Dhaka (Bangladesh), Kathmandu (Nepal) and Singapore. The other airline that flies is Bhutan Airlines. No. Simply because you are in good hands. Inspite of the dangerous terrain, this Himalayan airport has never seen an air-crash (touch-wood!)! From the perspective of a pilot, this is a difficult airport, but for a passenger, it is absolutely safe. If you intend to visit the viewing point at Paro airport, please make sure you know the ETA for the incoming flights. You can check it from the website, or do like I did- make a note of the time by observing for a couple of days if you have luxury of time. I got to view two landings at an interval of twenty minutes. The drive to the viewing point takes about fifteen minutes (by car) from the town. Be careful about shooting the landing or the take-off; the area around the airport is heavily guarded. Despite being one of the toughest airports to land at, there has not been a single mishap here. If you are a heart-patient with a fear of flying, you need to be careful. Love this post, I can’t imagine only having 8 pilots! How incredible that they have the skills to do their jobs! The only time I’ve had a similar experience was landing in Hawaii and the runway wasn’t very long. Thankfully the pilots there are very skilled too because if we didn’t stop we would have gone straight into the ocean! Will read up about Hawai airport too. The Pilots are highly trained and skilled and need to go for Refresher Course annually. They used to be trained in UK. Hey Divya, I got to experience this first-hand myself two weeks back. Quite an experience! Writing about it on my blog. Read your other posts – great going! Brings me back those Paro memories. Miss Bhutan. nice information. i read your all articles. it provide beautiful information….